What’s the best food for puppies? What makes a suitable puppy food? Feeding your puppy and feeding your adult dog are two different things. It’s important you know what to look for in the best puppy food brands, as your puppy’s needs will change throughout his development. Whether you’ve got a small, toy breed, a large breed or a giant breed puppy, the healthiest puppy food will always be designed to give them around twice as much energy as a good grown-up dog food. Calories are pretty high on the list of things you should look at in a reputable puppy food brand. Alongside healthy amounts of protein and fat, you’ll also need to consider all the vitamins and nutrients for growth. These can be tricky to understand at first, but don’t worry! We love puppies as much as you, so we’ve considered the most important things you should look for when choosing the best wet or dry puppy food. What’s in the best puppy food? Your little puppy is definitely going to need 25% to 30% protein, regardless of his breed. This is higher than what adult dogs need, as puppies are in a growth period where they’re building muscle super fast! The best puppy food will give your puppy this protein from real meat, so the first thing to look for is a main ingredient like chicken or fish. At the same time, you should look for puppy food without high levels of artificial ingredients like colors, flavors or preservatives. Really great brands will often make only the best puppy food that’s designed by expert nutritionists and completely free of artificial ingredients. Your puppy’s calories should come from fat as well as protein, and different puppies will need different amounts of fat. You’ll do your pup a big favour by choosing puppy food that’s right for his specific breed size, as the best puppy food for his breed will be designed with this in mind. Typically, smaller breed puppies grow faster than their large or giant breed friends and require more fat in their puppy food. The larger your puppy, the less fat he’ll require per unit of body weight, because giant and large breeds will grow slower. The best puppy foods will usually contain something that either adds more or takes away from 8% depending on the different needs of your specific breed. Look out for this when choosing, as the best food for puppies will often be designed for your little friend’s particular breed. Carbohydrate content will generally be something to consider for quality, rather than percentage level when it comes to dog food. dry dog foods and dry puppy foods are usually going to contain anywhere between 30 and 70% carbohydrates, which gives your puppy’s kibble it’s structure. It’s best though, to always look for something at the lower end of this range. Lower is better, because scientifically there is no carbohydrate that’s necessary for your puppy or dog’s diet. When shopping around or reading puppy food reviews, look for a puppy food that has most of it’s carbohydrates from healthy sources. The best puppy food brands will usually make sure to include quality ingredients like sweet potato or leafy vegetables. This means any carbohydrate in your puppy’s food is acting as a source of healthy vitamins. Small, large and giant breed puppies will require different amounts of calories each day. You’re more likely to find a suitable energy content if you choose a dog or puppy food designed for your specific breed. We’ve already mentioned that puppies will usually need about twice the daily calories of an adult dog, but it’s good to have a guideline in mind so you can pick the best puppy food for your little friend. Large breeds will usually weigh more than 50 or 60 pounds, but less than 90 pounds at full size. They’ll need more than small and medium puppies, so you’ll want to look for something that will total between 2000 and 3300 calories a day over 3-5 mealtimes. Giant breed dogs like St Bernards and English Mastiffs will typically grow up to be over 90 pounds, so you’ll be looking at something around the 3500 mark in the best dog food. In all cases, it’s important that you don’t take these caloric guidelines as a rule. Each dog will have different requirements depending on their specific breed and perhaps more importantly, their daily activity level. Super active puppies will require more energy and therefore kCals each day, as they’re burning more while they grow and have fun. How do I choose between dry food and wet food? 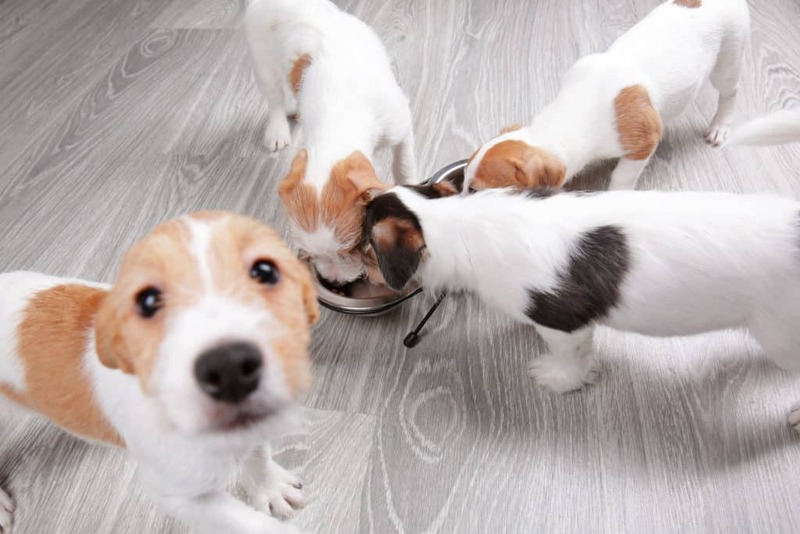 dry puppy food and wet puppy food have different characteristics, so the ideal ratio will be different depending on your puppy’s age and eating habits. Because there’s no one ‘best’ when you’re choosing between wet and dry foods, there are pros and cons of each you should consider when feeding your growing puppy. The main things to consider when deciding between wet and dry foods are moisture and variety. Wet foods have much higher water content than dry foods, meaning puppies who don’t drink lots can often benefit from having wet food mixed into their dry puppy food. It’s really important to make sure your puppy gets enough moisture, so if he’s not yet toilet trained you might want to take him outside shortly after he eats. dry puppy foods and dry dog foods are often a more economical choice. They last longer in storage and don’t go off after a few days like wet puppy foods. The best dry puppy food will also help keep those little teeth healthy because kibble structure is often carefully designed to help fight tartar. All puppies are unique, and some will prefer wet food to dry. A great way to find out the best ratio for your puppy is to mix in some wet food with his dry puppy food, and watch his physical reactions. The top rated puppy foods will typically give you clear instructions on the ratios you should use when mixing the two. Remember, variety can be a good thing and this applies to puppies too, so give your little friend a change once in a while as a treat! How do I know a good puppy food brand when I see one? There are several brands that make the best food for puppies, and unsurprisingly these are the same brands making the best dog food! We have several favorites that always deliver when it comes to quality ingredients and balanced nutrient profiles for your puppy. Natural food is number one with Blue Buffalo. 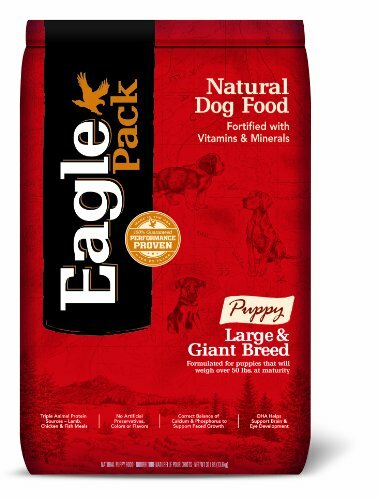 In fact, these American producers started up uniquely to make the healthiest puppy food around and believed top quality, natural ingredients were the way to go. Since they were founded over ten years ago, they’ve developed a range of top puppy foods in varieties like homestyle and chicken with garden vegetables. Family-owned Fromm rate food safety very highly, in the same way that quality products are at the top of their list of priorities for the best dog food. Fromm believe that the best dog food for puppies is grain-free and has real meat as the main ingredient. They also do a nice variety of different flavours, which are created to give your dog some choice. Award-winning Orijen have been one of our favourites and on our healthiest puppy food throughout all our puppy food reviews. They use regional ingredients in their products, which means that you’ll always be buying all-American puppy food that is never outsourced. Orijen actually receive daily ingredient deliveries from local sources and these ingredients are so fresh that it usually within their foods in under five days. Kirkland are best known for being CostCo suppliers of Nature’s Domain puppy and dog foods that come in completely grain-free varieties. They make puppy food from high quality sources, so your dog or puppy is only eating the best nutrients. They also make the best food for puppies because they pay attention to Omega fatty acids and amino acids for optimum health. Diamond are one of our top rated puppy brands because they design beneficial bacteria that’s especially made to help our pets digest food in a smooth and simple way. Every puppy food Diamond makes is manufactured here in the States, and they use a lot of quality meat. 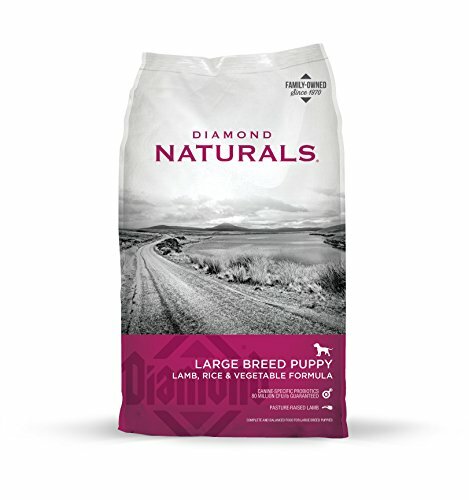 From pasture-raised lamb to wild-caught fish, Diamond are on our list because they make very, very healthy puppy food. IAMS started making pet food in 1946, and the pawprint logo you’re probably familiar with was first made famous in the 1970s. IAMS have a rock solid nutritional philosophy which puts protein right at the heart of all the best food for puppies, and we think they get extra brownie points for their charitable work rescuing pets and giving them homes. 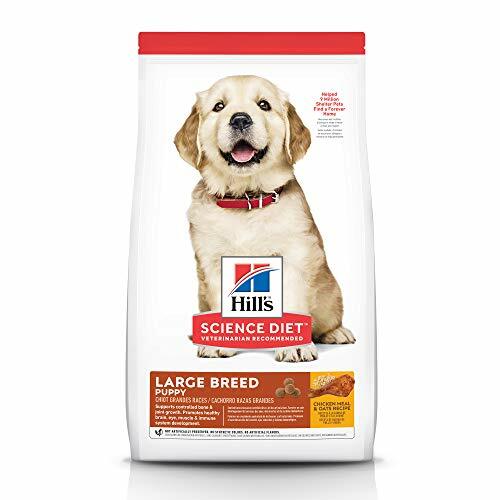 Hill’s was inspired in the 1930s by a guide dog called Buddy, whose owner believed that Buddy’s kidney problems were the result of the poor nutrition content of dog food at the time. Wanting to create dog and puppy food that would help other dogs from poor nutrition, he developed Hill’s dog and puppy foods in his own kitchen. Blue Wilderness is actually a specially designed line of dog foods that is owned by Blue Buffalo. We believe it deserves a special mention because Blue Wilderness puppy food is grain-free all the time and very high in proteins. It’s designed around the diet that wolves get in the wild, so it’s got everything in the right proportions for a strong, growing puppy. 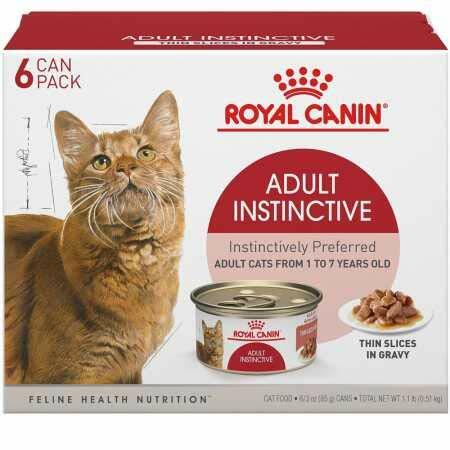 Royal Canin was founded in 1968 by vets, and their US manufacturers are based in Missouri and South Dakota. In our opinion, Royal Canin makes some of the best food for puppies because all their formulas are scientifically based, meaning they work up from nutrient profiles to create tasty dog foods. Great for healthy puppies! 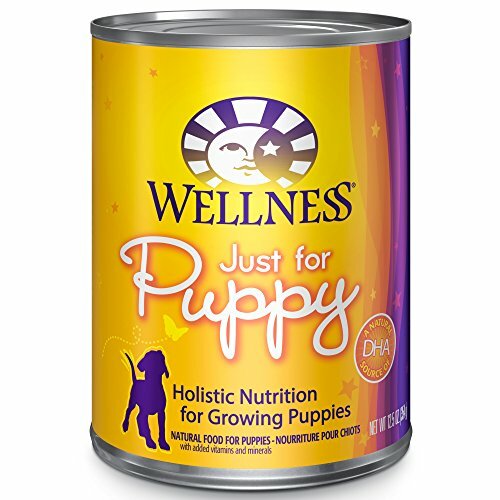 Wellness is one of our top puppy food brands because we’ve found that they focus very much on cutting out artificial fillers like meat and poultry by-product meals. They’ve only been around since the 90s, but this hasn’t stopped them from quickly becoming popular with vets across America for making puppy food that’s full of antioxidants and nutrients. Nutro have been making some of the best dog and puppy food out there since for almost a century, since 1926 to be exact. Nutro includes farm-raised meat in their products, relying purely on natural ingredients to create healthy, top quality puppy food. Their dry dog food manufacturers in the States can be found in Tennessee and California. Purina is also an all-American brand, which was established in 1984. Quite soon after they set up their first pet care and nutrition facility near Missouri. Purina’s charity initiative Pets for People has over 150 shelters across the states to help senior citizens adopt pets cheaper, which we think is pretty impressive. So, which is the healthiest food for puppies? We’ve done the research for you on what we think the 15 best dog food for puppies are, no matter how big or small! Whether your best friend is a small pooch or a playful giant, we chose and compared only the best brands based on all the dietary requirements we’ve outlined for you. 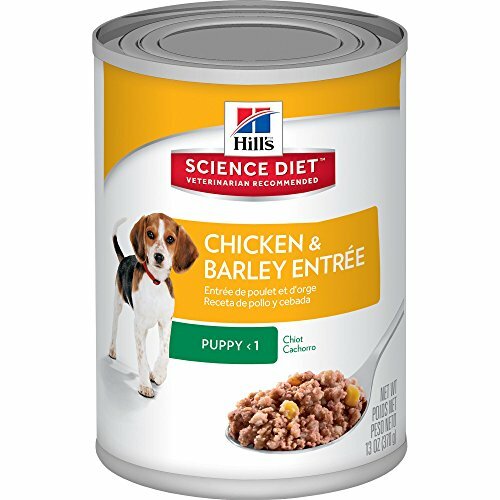 Hill’s has a great reputation amongst dog food brands, and it’s puppy food for small and toy dogs doesn’t disappoint. It’s USA-made with natural ingredients and contains fish oil for your small dog’s eye and brain development. 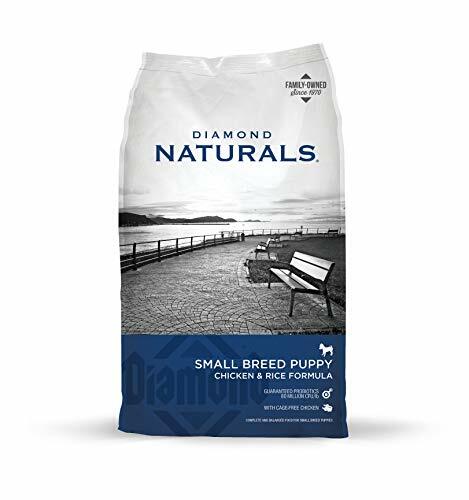 Another reputable brand, Diamond have come up with a corn, wheat and soy free formula for smaller dogs. The main ingredient is cage-free chicken, and it’s got small little kibbles for your little puppy’s baby teeth. 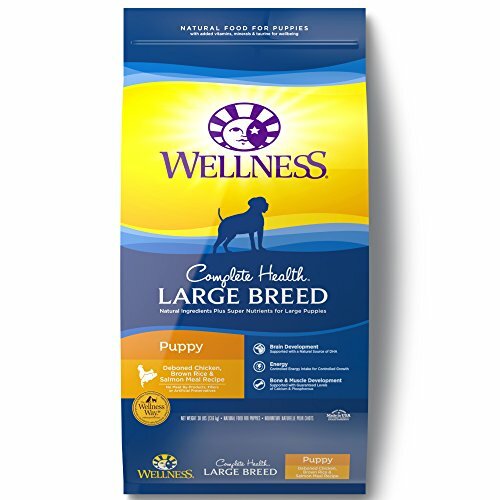 Wellness make a mean dog food, and their small breed puppy food is a completely balanced, holistic formula made especially for little pooches. As always in our puppy food reviews, we’ve chosen this as one of our top picks for it’s grain-free and all natural ingredient content. Plus, it’s super economical! 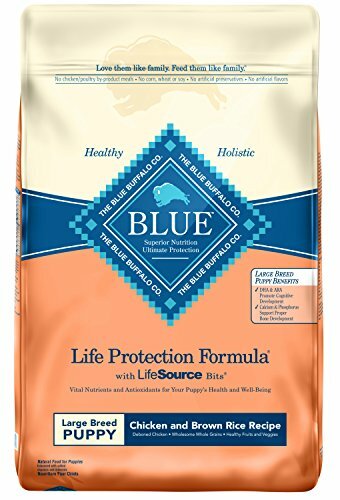 Blue Buffalo are known for making puppy and dog food that is free of by-product meals. As dog lovers, this is one of the key things we look for. It’s also well-loved by dog owners because it starts with chicken and works from there, meaning your puppy has a great protein-rich diet to grow on. 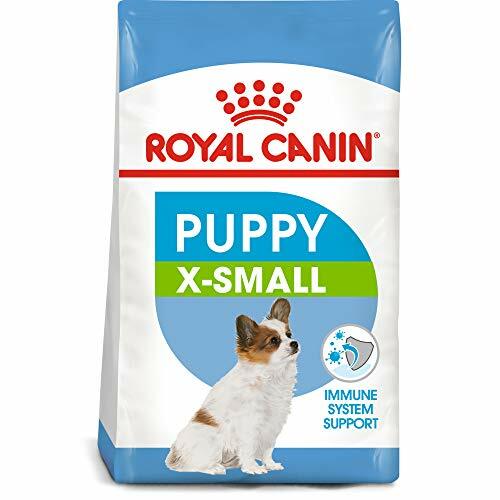 Royal Canin X-Small Puppy Dry Dog Food, 15 Lb. Royal Canin dry puppy food focuses on dental and digestive well-being for your toy breed puppy, meaning it’s one of the healthiest puppy foods out there. With cage-free chicken as the main protein source, it’s very common to see this premium dry puppy food stocked in vets and specialist stores. 29% protein, so super protein rich! Diamond have mixed pasture-raised lamb with veggies and rice in this large breed puppy food. They’ve also added superfoods for nutrients and antioxidants while once again making sure the final puppy food is easily digestible for your growing puppy. 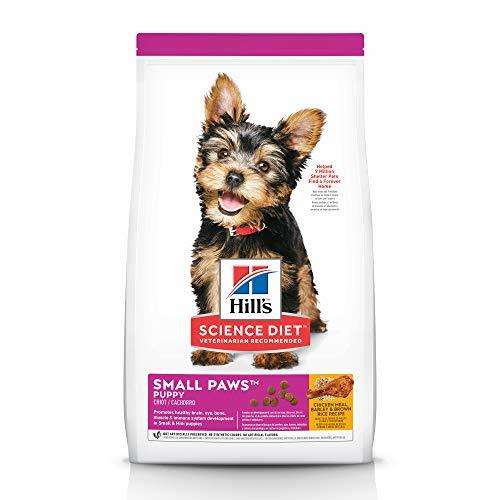 Once again Hill’s makes our list of top 7 puppy foods, this time for larger dogs. Your large breed puppy will be getting top quality ingredients as Hill’s make sure to stay away from artificial add-ins. 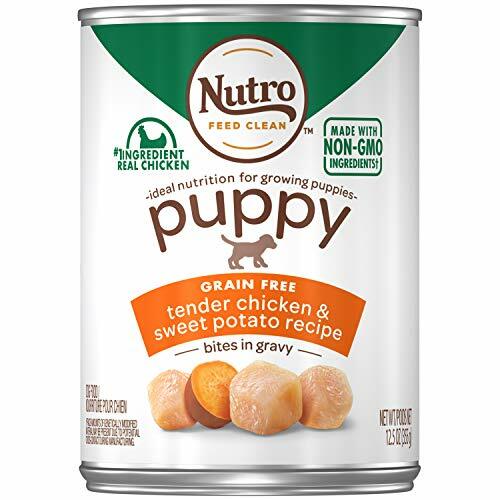 Nutro have developed a dry puppy food that leaves out chicken by-product meal, corn, wheat and soy proteins. 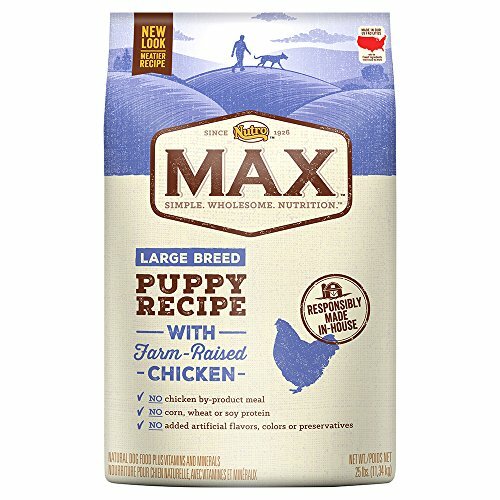 Chickens are farm-raised and the puppy food is specifically designed for large breed dogs. This one’s very hard to fault, as it’s economical and doesn’t even contain eggs! 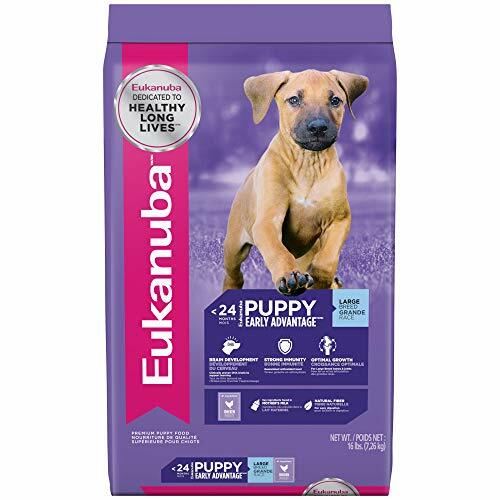 Eukanuba is a well-known favorite among vets and puppy owners alike. We’ve chosen this large breed dry puppy food for our puppy food review because it’s breed size-specific and provides balanced and holistic nutrition for growing puppies. 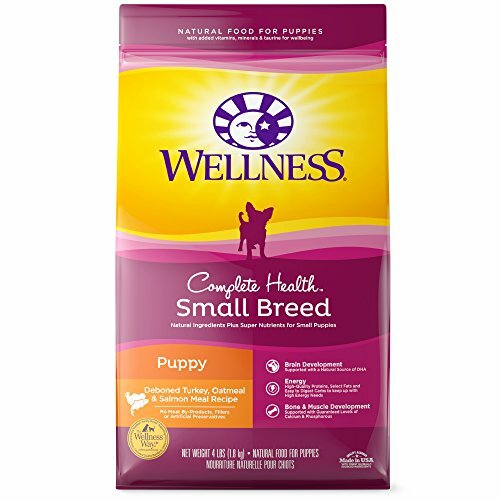 Wellness also make large breed dry puppy food, and we’ve listed it in our puppy food reviews because its made with premium and all-natural chicken. It’s based on a formula for complete nutrition, so contains natural vegetables. No meat by-products at all! This is another one that’s really difficult to find fault with, sorry! 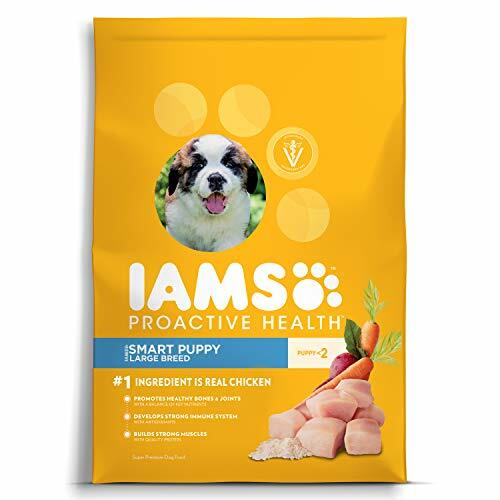 IAMS have used real chicken as the number one ingredient for this super premium puppy food. It’s another one we’ve selected because it is developed uniquely for large breed puppies and reflects all their needs in it’s nutrient profile. 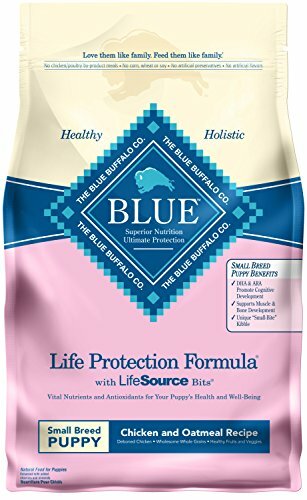 Like all Blue Buffalo products in our puppy food reviews, it’s made without corn, wheat or soy. Chicken is the main ingredient, and it’s got cute, specially designed bits in it that are full of natural minerals and vitamins. Rough kibble surface fights tartar, so hopefully your puppy won’t be breathing too much doggy breath when he comes for a hug! The 14% fat content is at the higher end of the recommended level for large puppies, so make sure you’re walking your puppy enough! 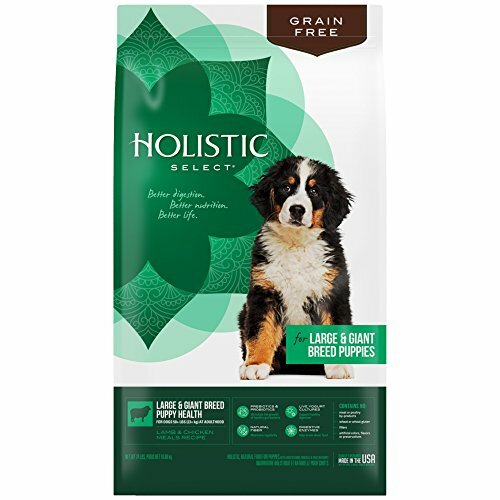 Holistic Select is completely free of grains, and has a nutrient profile designed specifically for giant breeds like Irish Wolfhounds and Leonbergers who take a little longer to reach adult size. If your puppy prefers lamb instead of chicken, this is one you can use to experiment with while looking for the best puppy food. Royal Canin dry puppy food is made for dogs who grow up to 100 pounds at adulthood, so it’s based on a formula that especially emphasizes bone and joint health. At the same time, it’s very protein-rich, so great for lean muscle development. With 32% protein, this packs the biggest punch of all the puppy foods we’ve looked at so far! Eagle Pack is lamb-based and developed with the vitamins and nutrients for smoothly functioning immune systems. It’s also got giant breed’s joint and bone health in mind, while covering calorie control for these big-eater puppies. Contains Vitamin B12 for energy release, making bouncy happy giant puppies! Hill’s wet puppy food is full of chicken and liver for all kinds of puppies. It’s got a gently digestible fiber content, so it’s tender on your growing puppy and has a bunch of savory, lean protein for muscle growth. It’s got a little less protein than other brands, but at 8% it’s still very much one of the healthiest puppy foods we analysed for our puppy food reviews and when moisture isn’t considered this totals 28%! 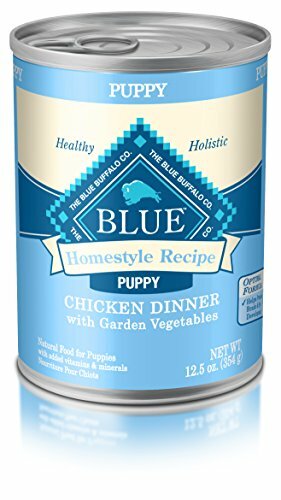 Blue Buffalo have formulated a homestyle wet puppy food that has deboned chicken as it’s main protein source. Carrot, sweet potatoes and fruit are mixed together to make a “chicken dinner” for your puppy winner! None we can find! It’s right up there on our ‘best dog food for puppies’ list! Woof woof! 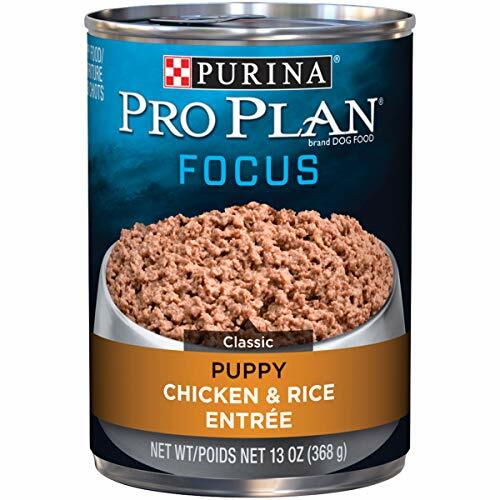 Purina’s wet puppy food is easily substitutable, one 13 ounce can at a time for a cup of their dry puppy food. It’s number one product is real chicken, followed by liver. This is a truly premium product we consider right up on our best dog food for puppies list. Main ingredients are chicken, chicken broth and salmon, and it’s carbohydrates come from sweet potatoes. Price-wise, Nutro wet puppy food is in the middle, yet it’s very much high on our recommended puppy food list because it’s got great ingredients. It’s got so many different kinds of chicken, and doesn’t stop listing real meat content till the sixth ingredient! Each puppy is unique, and what works for one little guy may not work for the next. As with all dog foods it’s best to mix it up a little at first, and see what your puppy enjoys. A happy, healthy and playful puppy will have shiny bright eyes and clear nose, mouth and ears. He’ll also have relatively fresh breath (not overly-doggy breath!) and a clean shiny coat, although puppy coats will sometimes shine less than their adult counterparts. How long should my puppy be eating puppy food? The best dog food for puppieswill contain high amounts of protein and calories for healthy, growing little (or not so little!) puppies. Once your dog reaches a certain age, he’ll no longer need all the extra energy and a puppy food diet will mean he’s getting too much of his daily protein requirements. As a general rule, your puppy will need to switch from puppy food to grown up dog food when he’s reached his adult height, which will vary between breeds. A common time for this to happen is when your puppy reaches between 6 months and 12 months old. It’s important to know this will be different between breeds, as smaller dogs will likely reach adulthood before larger puppies. Typically this might mean your Chihuahua puppy may reach adulthood at 12 months, while your Great Dane might take almost 2 years to mature. When your puppy is ready to switch to adult food, you can use our guide above to make sure you’re doing this gradually. Can my puppy eat human food instead of puppy food? 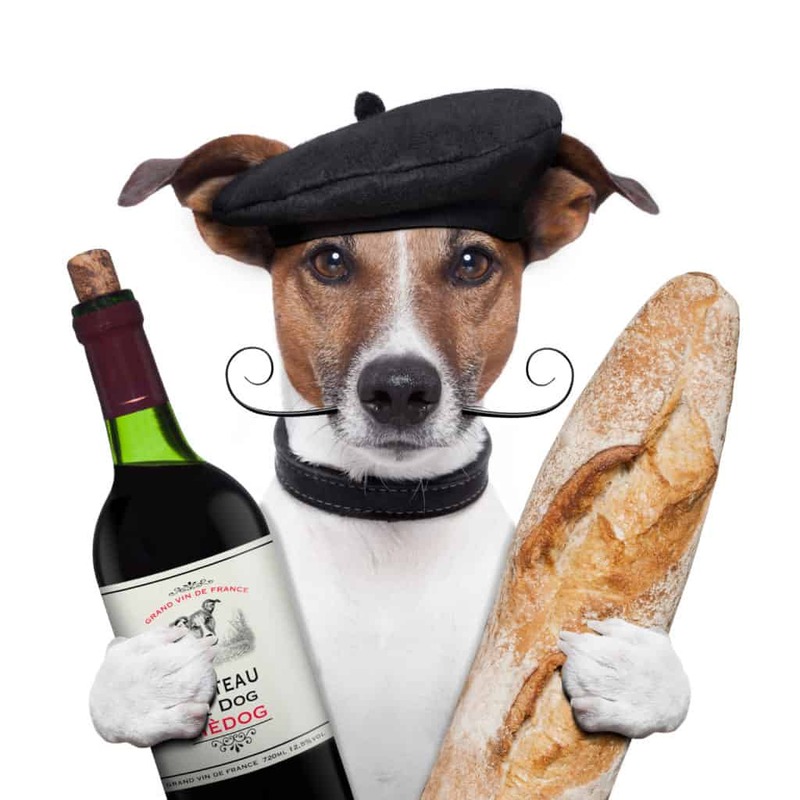 Dogs metabolize food in a different way to humans. It’s definitely recommended that you feed your puppy a healthy combination of wet and dry puppy food designed by nutritionists especially for his health. If you’re really set on feeding your puppy human food, make sure it’s only a very small part of his diet. You’ll also need to ask a vet or research carefully online before feeding your dog anything that’s not recommended puppy food, as many things we consider snacks are poisonous to dogs. How do I switch to the best puppy food? Whether you’re switching from one dry puppy food to another, or simply want to change from your current brand to a good puppy food, it’s advisable to do so gradually. While it might be tempting to start your young sidekick on his new chow right away, remember that he could get a tummy upset if he switches too fast. A week is typically a good amount of time for your puppy to get slowly used to a new food as you make the change, because he’ll have time to adjust. Puppies need to eat lots more often than adult dogs, meaning you’ll probably be feeding your puppy from anywhere between 3-5 times a day until he’s 4 months old. All breeds will be different however, and each puppy will want to eat more or less frequently depending on his age, activity level and weight. These meals should be at regular periods throughout the daytime, and it’s not a bad idea to weigh these at first. For more information you can see our page.